Today marks a truly historic anniversary, one which I’ve been hoping to talk about ever since I got back from Europe. You see, in addition to being the centennial of the outbreak of hostilities in World War I, 2014 also marks the 70th anniversary of the liberation of Europe in World War II. 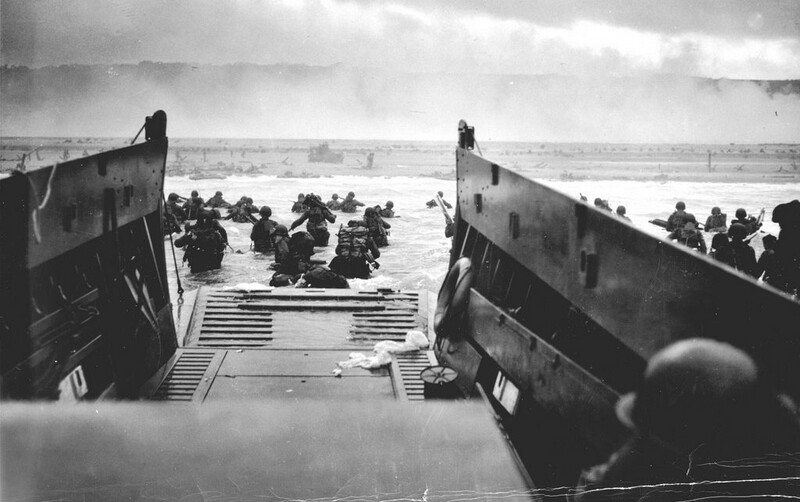 And it is today, on June 6th, that this began with the Allied landings in Normandy on D-Day. Codenamed Operation Overlord, this campaign was the beginning of the end for Hitler and his Third Reich. I consider myself a very lucky person since this past April, I was able to see where much of this Operation took place. In addition to some of the beaches where the initial landings occurred, we also got the see the French countryside where the greatest amphibious invasion in history would extend into one of the greatest military campaigns of all time. And while doing this, we got to establish a personal connection by learning about how some of our family member died during and shortly after that “Day of days”. Planning for this invasion – which involved a 1,200-plane airborne assault , preceded an amphibious assault involving over 5,000 vessels and Nearly 160,000 troops – began in earnest in 1940 after the fall of France. But with the invasion of the Soviet Union in the summer of 1941, the Allies found themselves under increasing pressure to open a “Second Front” in Europe. But logistics, and concerns over heavy casualties, delayed any such operation for a full three years. Having learned the lesson of Dieppe, the Allies knew that any assault on the German-held coast of France would depend heavily on three major items. For starters, it would require sufficient manpower and support to succeed in making an initial landing. Second, it would require a functional port facility to ensure that supplies could make it into the foothold, once established. And third, it would require extreme secrecy to ensure that the Allied landings would achieve the element of surprise. This is not to say that plans for an earlier invasion were not considered. In fact, in 1942, then Brigadier-General Dwight Eisenhower drew up a formal plan to land an invasion force on the broad beachheads between Boulogne and Le Havre in north-eastern France. Reflecting American enthusiasm for an early entry into Europe, as well as a desire to reduce pressure on Soviet Forces in the East, the plan was shot down by Churchill and British military planners who saw it as unrealistic. A second plan was also suggested for an early entry into Europe that year, which was known as Operation Sledgehammer. As a contingency to Roundup, this plan called for Allied forces to seize the French ports of either Brest or Cherbourg during the early autumn of 1942 along with areas of the Cotentin Peninsula. They were then to amass troops for a breakout the spring of 1943, coinciding with the Roundup landings farther to the east, and then move south into France. Wanting to avoid a costly confrontation similar to the Somme in World War I, Churchill advised that they focus instead on the Meditteranea. Much like the plan to strike at the enemy’s “soft underbelly” by landing in Galipoli and Southern Europe in World War I, this alternative seemed like a good way to strike at the Axis where they were weakest. Following the defeat of Axis forces in North Africa, this plan of attack began with the invasion of Sicily in the summer of 1943 and the Italian mainland by September. These operations provided the Allied troops with valuable experience in amphibious warfare. What’s more, the ill-fated operation at Anzio (Operation Shingle) in January of 1944 provided some additional lessons of what not to do during an invasion. Here, the Allied commander had failed to take advantage of the element of surprise and waited to consolidate his forces before attempting a breakout. As a result, a German counter-attack succeeding in eroding the beachhead until operations further south forced the Germans to withdraw. With all these lessons learned and preparations now complete, the Allies began to plan for the invasion of France in detail. The operation – dubbed “Overlord” – called for an amphibious invasion of five beachheads along the Normandy Coast. While the American 1st Army (under Gen. Omar Bradley) would land in the Western Sector at Omaha and Utah, the British 2nd Army (under Gen. Dempsey) would land These would be preceded by massive aerial and naval bombardment, plus the airborne landing of thousands of paratroopers in the interior. 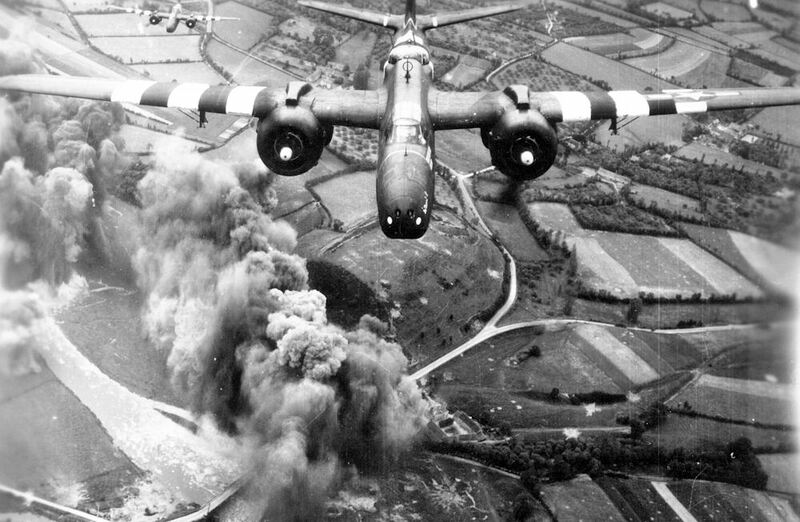 The landings were to be preceded by airborne drops in the Normandy countryside, which were to be carried out by the American 101st and 82nd Airborne Divisions. The landing would take place near Caen on the eastern flank to secure the Orne River bridges, and north of Carentan on the western flank. The initial goal was to capture Carentan, Isigny, Bayeux, and Caen and take control of key crossroads and bridges to prevent the Germans from mobilizing a counterattack against the Allied beachhead landings. Once ashore, the Americans would advance inland from Omaha and Utah to cut off the Cotentin Peninsula and capture the port facilities at Cherbourg. From Sword, Gold and Juno Beaches, the British and Canadians would capture Caen and form a front line to protect the American flank, while establishing airfields near Caen. Possession of Caen and its surroundings would give the Anglo-Canadians a suitable staging area for a push south to capture the town of Falaise. With Normandy and the Contentin secured, the Allies would drive east to the Seine River and the liberation of Paris, which Montgomery envisioned would take 90 days. 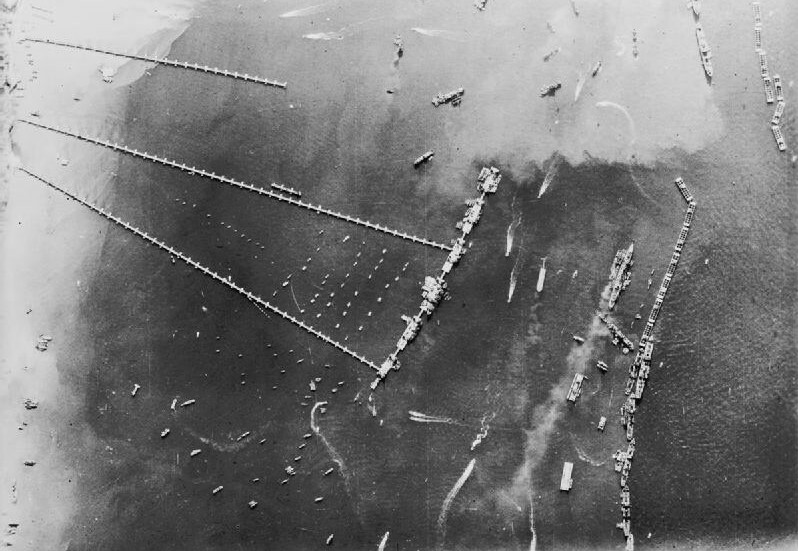 And to address the issue of supplies, the Allies also committed to building two artificial harbors (known as Mulberry Harbors) that would be transported across the English Channel and placed at the Omaha and Gold Beaches. From these, the Allies would be able to keep the supplies flowing until Cherbourg and other port facilities were secured along the coast. And in the months leading up to the invasion, the Allies conducted a substantial campaign of military deception, codenamed Operation Fortitude. Using both electronic and visual misinformation, and passing on intelligence through double-agents, the Allies were able to mislead the Germans as to the date and location of the main landings. 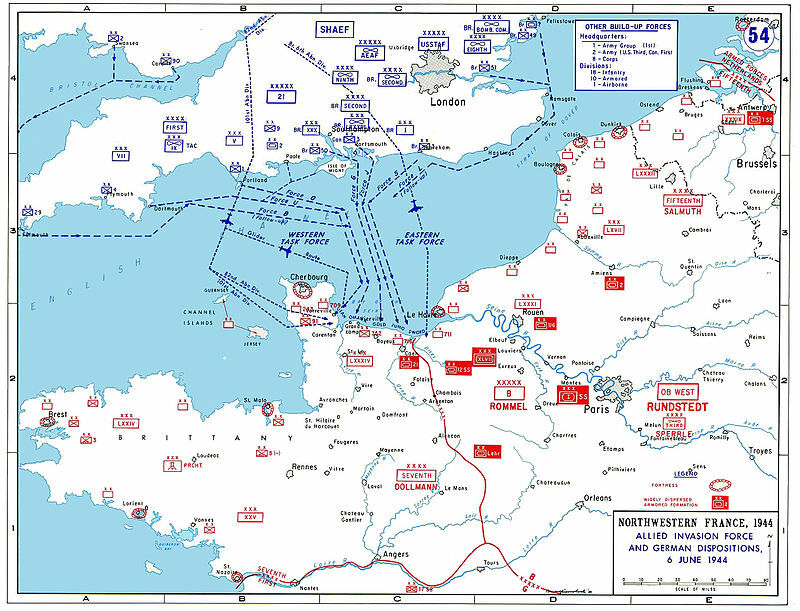 The Normandy invasion, according to this misinformation, was merely a feint designed to lure German divisions away from the real landing site – the Pas de Calais region. To really sell the Germans on this fake plan, a phoney army was commissioned at Dover, England. Here, real military units were stationed alongside artificial tanks and trucks to create the illusion of second, larger landing force that was preparing to land off the coast at Pas de Calais. General Patton, whom the German High Command still believed to be the Allies top general, was put in command of this phoney army. As a result, much of the German army would remain at Pas de Calais to defend against Patton’s supposed attack, even as the Normandy landings were taking place. On June 5th, minesweepers began clearing lanes across the English Channel for the invasion, and troops began to load onto their ships from twenty departure points along the southern tip of England. The ships met at a rendezvous point nicknamed “Piccadilly Circus” south-east of the Isle of Wight to assemble into convoys to cross the Channel, and a thousand bombers and aircraft left before dawn to attack the coastal defences and drop airborne troops behind enemy lines. The invasion had begun! On the dawn of June 6th, preliminary naval bombardment from five battleships, twenty cruisers, sixty-five destroyers, and two monitors commenced. Their guns began firing at 05:45 am and continuing until 06:25 am. Five minutes later, infantry began arriving on the beaches in all five sectors. At Utah and Sword, resistance was light and the landings successful, and Allied units were able to make it shore with minor losses. At Omaha, Juno, Gold, and Point-de-Hoc, things did not go as planned. In all of these cases, resistance proved stiff and the landings were complicated by high wind and choppy seas. At Point-de-Hoc, where the Rangers were tasked with seizing several coastal batteries, they managed to reach the top of the cliffs while under enemy fire, only to find that the German guns had been moved ahead of time. At Juno and Gold, British and Canadian forces experienced a tough fight as they were initially forced to land and take out the German positions without armor support. 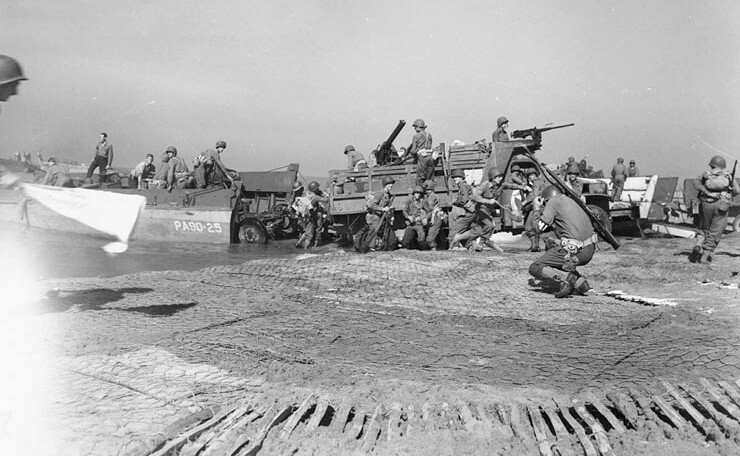 But the worst fighting took place at Omaha, where German machine gunners, firing from bunkers that had not been destroyed by the preliminary bombardment, and located atop sea bluffs, fired on the exposed landing craft and troops. To make matters worse, the 1st American Infantry Division faced an entire German Infantry Division, rather than the single regiment that was expected. Combat engineers were also unable to clear the beaches for their tanks, forcing the Americans to advance without armored support. In the end, disaster was averted thanks to troops and engineers making their way up five gullies along the sea wall, which allowed them to outflank the bunkers and take out the German machinegunners. By early afternoon, all the beachheads were secured. By 16:00, the German 21st Panzer Division began mounting a counterattack between Sword and Juno, but met stiff resistance and were forced to pull back to defend the area between Bayeux and Caen. Farther inland, the Airborne drops also did not go as planned. For the 82nd Airborne Division in the east, several of their gliders crashed or were shot down and some 5,245 troopers were killed, wounded, or missing. 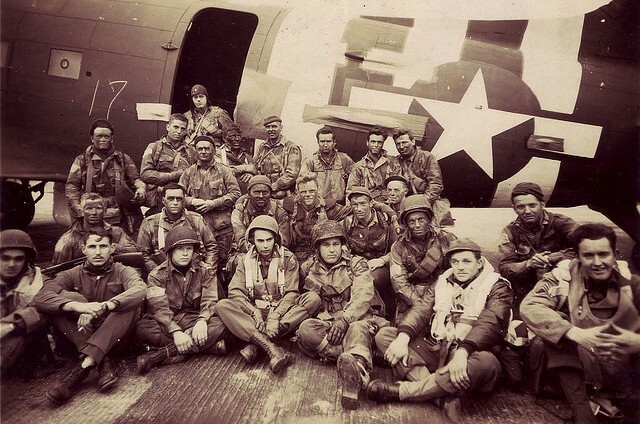 In the west, the 101st Airborne’s landing were scattered due to unexpectedly high German anti-aircraft fire, and the division suffered some 1,240 men killed, wounded, or declared missing on that single day. However, in the days that followed, both divisions were able to consolidate, take their objectives, and fight off numerous counter-attacks by German troops. All told, Allied casualties on the first day of the invasion were at least 12,000 with 4,414 confirmed dead, compared to 1000 lost by the Germans. 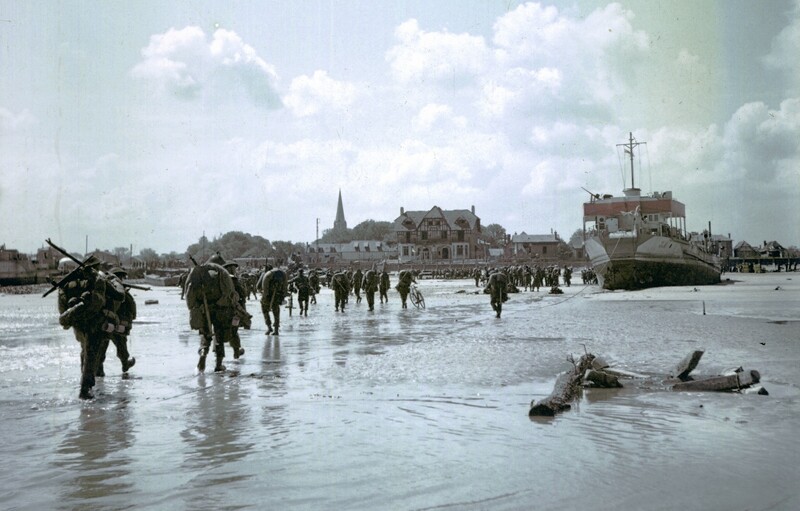 In addition, only the Canadian forces that had landed at Juno were able to achieve any of their D-Day objectives, which included the seizure of the towns of Autrie and Carpiquet and the high ground west of Caen. In addition, the Allied invasion plans called for the capture of Carentan, St. Lô, Caen, and Bayeux on the first day, as well as the connection of all the bridgeheads. None of these objectives were achieved. The five bridgeheads were not connected until 12 June; and Caen, a major objective, was still in German hands at the end of D-Day and would not be completely captured until the 21st of July. However, as the old saying goes “No plan survives contact with the enemy”. And no one who witnessed the great undertaking – including the Germans – could say that the operation had not been a success. Nearly 160,000 troops crossed the English Channel on 6 June, and more than three million allied troops were in France by the end of August. For all those involved and concerned, the invasion of Normandy was the beginning of the end of the war. Whereas the Germans had suffered multiple defeats in Russia, North Africa, Sicily and Italy – and already knew that they were not going to win the war – their defeat was not yet inevitable. When news had reached Hitler’s ears of the invasion, he was promptly advised that his only recourse was to “End the war”. 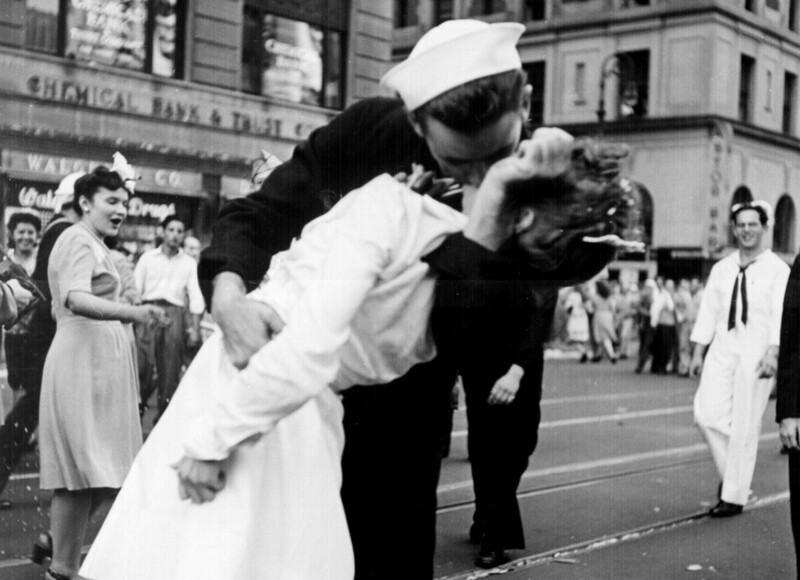 Naturally, he did not, and it would be almost another year before the war officially ended. But it was the sacrifices made by those many brave souls on this day some seventy-years ago that made the end of this terrible war inevitable. And so its only fitting that people all over the world are coming together to commemorate it. As I write this, countless veterans, civilians, and world leaders have converged on Normandy to pay their respects to the many soldiers and civilians who died on D-Day and during the Battle of Normandy. This included some 1000 veterans who participated in Operation Overlord, the youngest of which are in their 80s. Nineteen world leaders were present at the event, including US President Obama, French President François Hollande, Canadian Prime Minister Stephen Harper, Russian President Vladmir Putin, German Chancellor Angela Merkel and Petro Poroshenko, Ukraine’s president-elect. For some of these leaders, it is the first time they have met face to face since Russia annexed the Crimea, drawing condemnation and sanctions from the West. It is good to see that seventy years later, people are able to overcome their differences and come together to reflect upon the lessons of history. Perhaps we can draw some inspiration from this and effect some change in the present as well. For those who lived through the Second World War, many of whom were old enough to remember the First World War, it was obvious that the world would not survive a third. Remembering the past is not only important since it made the present possible, its also intrinsic to avoiding the repeating of it. If I get the chance I’ll write my own post on being on the beaches where D-Day took place. Which ones did you visit again? I know Omaha was on there, but which others? Utah. I also visited Pont-du-Hoc, where you could see plenty of craters. It was crazy. So I’ve heard, and seen in photos. I actually thought I was looking at a World War I site when I first saw it. I can understand that impression. There are craters and trenches there, after all.